Here's a Christmas card I've just finished (my first... might be my ONLY, lol lol lol). 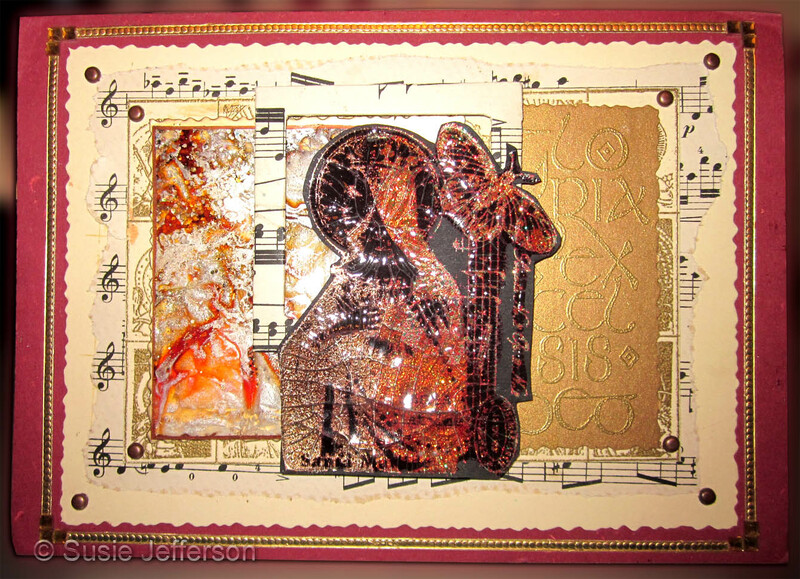 The Caught In Crystal piece is on the left of St Matilde, layered under the slide mount (which I've covered with vintage sheet music to match the background layer, which in turn is layered to deckle-edged cream card, then to a top folded dark red card. The gold detailing at the edge is German scrap and some little diamante stones. The background piece is the old Caught in Crystal technique (acetate, squirt dimensional adhesive - Diamond Glaze, Glossy Accents etc - on the back, then add reinkers. Crumple up some giftwrap tissue, plonk on top, allow to dry). 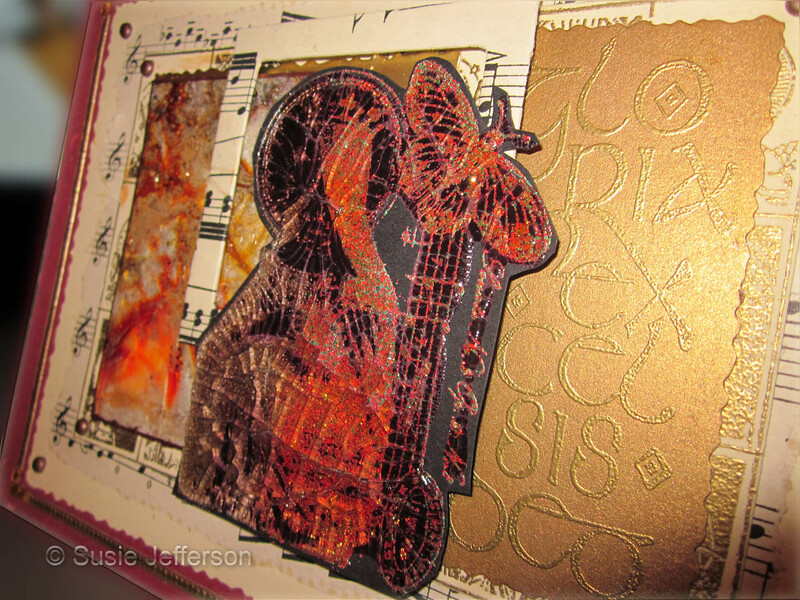 What I've done here is the updated version - exactly the same but using alcohol inks (Tim Holtz) which gives a much brighter effect, plus it dries a lot quicker. This needs to be limited to 3 or 4 colours, or it starts to look muddy. Of course I've added my own special touches: mica powders, glitter, German Glass glitter etc etc. Stamped and embossed in gold onto black card, I've painted with Twinkling H20s and coated really heavily with Tim Holtz's Crackle Accents - it really picks up the sparkle! I'm really impressed with the result and will be buying more! 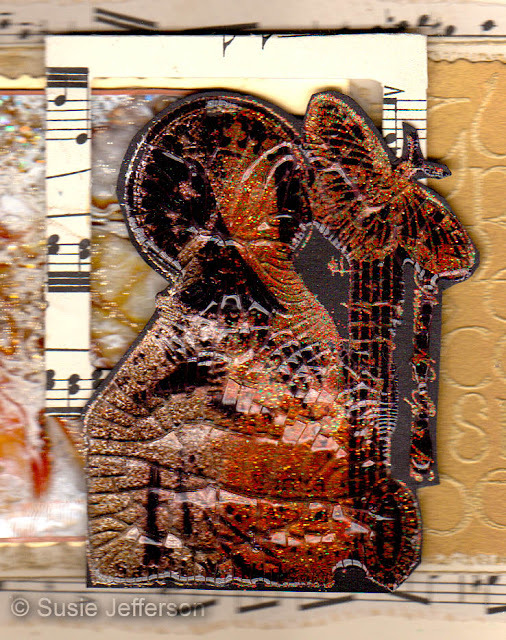 The Stampington St Matilde image uses the Faux Cloisonne technique: stamped and embossed in gold then painted with Twinkling H20 paints. Once dry, I did a little variation: flooded with Crackle Accents. Doesn't it look effective! It took overnight to dry, but my goodness I do like this crackle. 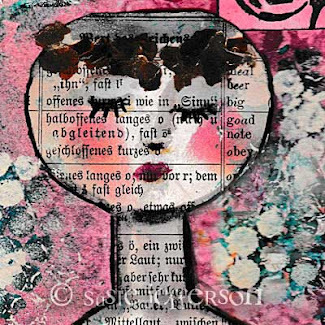 Just found your site, love the saturation of vintage craftiness and creativity. I shall follow and come back for more inspiration. So glad you like it! Thanks so much for the compliment.